Ever since the foundation of Stairway in the early 90’s, theatre has been one of our key advocacy vehicles. Not only a powerful form of communication, theatre also serves as an effective healing device for youth who have been a part of this organization. Cracked Mirrors is a bold attempt at understanding the deep pain and suffering children go through as a result of sexual abuse. Through a series of poignant and gripping vignettes, woven together by rap and son, we get a glimpse into the lives of 4 victims. The play is performed with striking conviction by 3 members of Stairway’s homegrown theater group, TASK (Talented Ambitious Street Kids), who themselves used to live and work on the streets. The authenticity they manage to emote throughout their monologues stems from their personal relation to the issue of abuse that they confront. 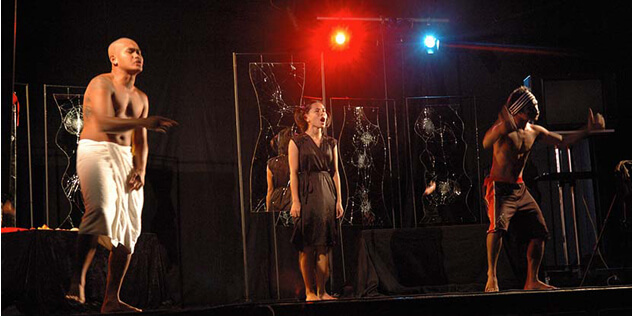 Performances are generally followed by the 3 performers coming back on stage to share with the audience some of their personal stories in relation to the issue. Cracked Mirrors has been shown to hundreds of groups of government organizations (GOs) and non-government organizations (NGOs), students, teachers, social workers, and church groups as part of on-going information and training workshops on Children’s Rights and Child Sexual Abuse Prevention. Aside from being a creative and extremely effective tool in all trainings facilitated within Stairway’s Learning and Resource Center, the play has also toured and reached thousands of audiences in Thailand, Singapore, Denmark, Germany, Belgium and Australia. Wherever it goes, it has the same effect of stirring up emotions and challenging spectators’ views and perceptions regarding the issue of child sexual abuse.